Foodista | Debate - Should Fast Food Be Purchased With Foodstamps? Debate - Should Fast Food Be Purchased With Foodstamps? The U.S. Department of Agriculture reports that from 2005 to 2010, the number of businesses approved to accept food stamps grew by one third. This includes convenience and dollar stores, gas stations and pharmacies. Now, fast food restaurants like Taco bell, KFC, Long John Silver's and Pizza Hut (all owned by the YUM! 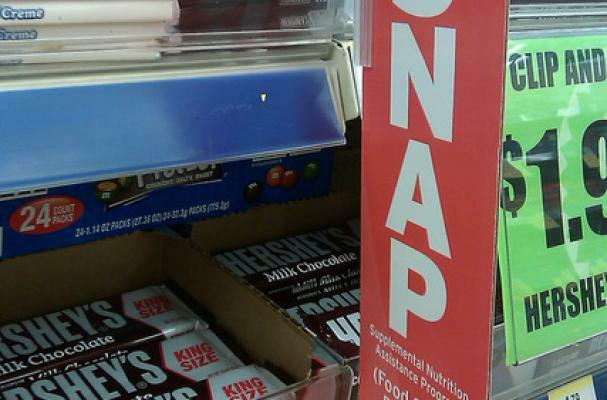 brand) are trying to become food stamp friendly. The argument is that that allowing SNAP benefits at these places will benefit the homeless, elderly and disabled, who otherwise have difficulty buying and preparing meals on their own. What do you think? Should food stamps be allowed in fast food restaurants? These restauraunts are not looking out for the welfare of the abovementioned people. They are not doing it to help out anyone. They are hoping to rope in the almighty dollar, in any form. Using SNAP to buy food at a FF restaurant will eat into the already thin budget for the month. There is nothing healthy or good about eating at a FF restaurant. Feeling full does not equate being nourished. These junk foods do not offer any sort of staying power, and leave you feeling hungry shortly after consuming. The health ramifications of eating numerous meals of FF, have been documented ad nauseum. Why would we want to make it even easier for people to partake? Your turn. How do you feel about it? By the same token, grocery stores aren't looking out for those people either. Take a look at the circular in a disadvantaged area to see what's on sale vs that in a more affluent area. Tampico punch. Ramen noodles, cheap bologna/hot dogs/etc... pure fruit juice, such as grape, orange, grapefruit, etc. is high as hell, as are good veggies, and don't even think about getting a healthy cereal, because they're not on WiC, and never on sale. Trix is 1.99 - shredded wheat is four bucks. I say check out a copy of Eat this, Not that from the library, and make better fast food choices. A bean and cheese burrito with tomato and lettuce is way better than tampico punch and mixed meat bologna on bad bread. And the argument that these people cost us money in health care is hooey, because they don't go to the doctor! I grew up on welfare and we never went. I go more now for silly stuff like a toothache - when I was poor, you just put cloves in your mouth and went to bed. Sorry... I get all wound up. A valuable thing would be to teach people on welfare how to shop for groceries instead of banning foods and judging them. When you really want people buying healthy food for food stamps, than make healthy food more affordable! I was may be one or two times in my life at MacD I didn't like it! I am used to fresh and home made food!! But I know that I am privileged!! I work at Little Caesar's and we accept food stamps. The catch is you can't buy hot food on food stamps so if they want a cooked pizza instead of take-n-bake they have to pay 50cents per pizza out of pocket. I agree with you completely Amy. The cost of one fast food meal for one person could buy all the ingredients to make a meal large enough to feed a family if four. This decision is totally money driven and the people who would use their benefits on FF would definitely suffer for it. there are good choices and bad choices that is obvious. everyone should have the right to make those choices for themselves unless deemed unfit by a court of law. our country is supposed to be based on freedom. I can see both sides of this debate. If you've lived in an inner-city area, you know that even finding edible fresh produce is hard to do, and healthy food even harder. Plus if you're living in an SRO hotel, weekly motel, or your car, you have little to no ability to cook. On the other hand, I don't consider things like KFC to even be food, much less healthy! What I'd like to see is a compromise - either by limiting it to areas where good fresh food isn't available nearby, or by limiting it to somewhat healthier menu items. I think it would be better if they changed the law to allow a certain amount or percentage to be used for things they need besides food. Like what? Like toilet paper, shampoo, bath soap, laundry soap, etc. Why is it that you can buy junk food but not needed items? As far as the cheap stuff goes, when you're trying to feed your family of 4 on $300 a month in FS, you go as cheap as you can.